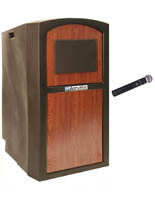 These outdoor podiums and plastic lecterns are engineered for durability. In fact, the tough polyethylene shell of each pulpit has been proven to withstand the special stresses associated with exterior use in all weather conditions. 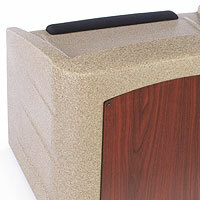 The rugged construction also ensures that each plastic outdoor podium is very lightweight as well as water resistant. 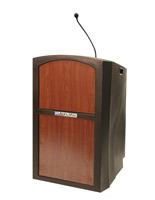 These plastic lecterns are semi-hollow and come with built in wheels for ease of movement. These durable outdoor podiums are great for a variety of events, including graduation ceremonies, rallies, festivals, conventions, product launches and political demonstrations. 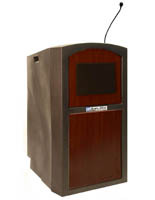 Of course, the weather resistant speaking stands can be used as lecterns at indoor events as well, including trade shows and press conferences. The versatility these recycled plastic lecterns offer ranges from serving as concierge or valet stands in outdoor dining environments to facility fixtures at sporting clubs and associations to business use at product launch events to outdoor preaching and ministry stands. The one-piece molded design is not only lightweight but also has sleek rounded corners as well as open rear shelving for storage. What sets plastic lecterns apart from "regular" speaking stands? 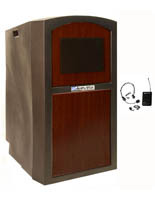 Outdoor podiums are crafted from recycled materials to reduce the environmental impact. Companies and organizations frequently purchase these pulpits for exterior use simply because they care about the global environment. Image is everything these days, especially when it comes to "going green". 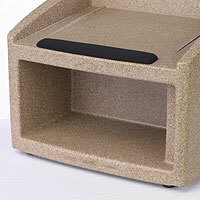 Think about the effect these podiums that are made from recycled material will have on your audience or customers! 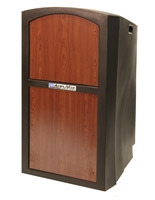 Style is another important facet of these outdoor lecterns. All of the models we sell feature decorative panels that go on the front. There are panels that resemble the look of wood, marble, and granite, so customers can create just the look they need. The paneling can also be changed with relative ease, which makes changing the appearance quite simple and inexpensive. 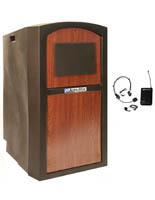 We even offer extra and replacement panels if the user wants to change the look or if the panel has sustained damage. Functionality is also an important consideration to make when selecting one of the outdoor lecterns. We carry tabletop designs that fit neatly on counters, tables, and other presentation areas. These models are compact and can be moved very easily. Floor stands are also available and feature full height. These units are ideal when there is no existing surface on which to place a tabletop system. What is neat about the floor-standing lecterns is that they come with built-in tilt-n-roll wheels, so rolling from one location to another is effortless. 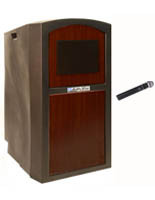 We also provide sound system options for the lecterns. 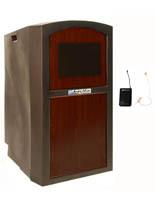 In fact, one unit includes a built-in public address system that is perfect for outdoor conferences and events. Make sure your audience can hear every word, so they don't miss your important messages! Podiums with built-in sound systems include a wide-frequency response electret gooseneck microphone that is both sensitive and clear. There is also an integrated 25 foot audio output XLR cable, so plugging in the mic is not trouble at all for the lecturer. The included XLR cable also allows the user to connect to the provided voice amplification system. Broadcast loudly and clearly with a full 50 watts from the dual Jensen speaker on the front. Both wireless headset and lapel microphones are included with the package, so public speakers do not have to feel so tethered while they present their information. Check out the product pages for all the specifications, connections, and capabilities. We can't put enough emphasis on how important it is to be environmentally conscious in today's world of business. As mentioned above, the nearly unbreakable construction of the pulpits is made from recycled goods. Everyone should do their part to reduce their consumption, and buying plastic outdoor pulpits made from reused components is the perfect way to prevent waste. The innovative design reduces energy usage and air pollution that comes from incineration and land filling. You can do your part to save the environment just by buying recycled lecterns and public speaking stands. What's even better is that the lecterns can are 100% recyclable themselves! Molded plastic lecterns go through significant testing during the engineering process. These OSHA approved pulpits have been tested to withstand a 60 foot drop, so you know they will endure years of rough use. If you're looking for pulpits that will last a long time and that you never have to worry about people ruining when moving it, then one of these rugged lecterns is for you! Choose from beige and black finishes with a variety of front panel options. Such a vast line of options makes it so it is easy to match most any color scheme. 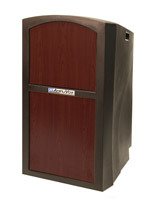 Podiums2go is always looking for new color alternatives to add as well, so you should check back often.